We acquire used stair lifts from customers much like you - people who invested in a stairlift but no longer have need of an in-home accessibility solution. We purchase the used stair lift units, inspect and service them to ensure that they meet our standards of safety and quality, and then resell them at a steeply discounted price. If you thought our reconditioned stairlifts were a great deal, you won't believe the low prices on our used models. Call 1 (866) 488-9802 to place your order now, or contact us via email for more information. 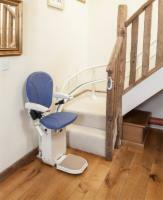 Interested in selling your used stair lift? Click here to read about our buy back program! Check the Compare check boxes next to the Used Stair Lifts you wish to compare. Who Needs A Stair Lift? What Kinds Of Stair Lifts Are There?